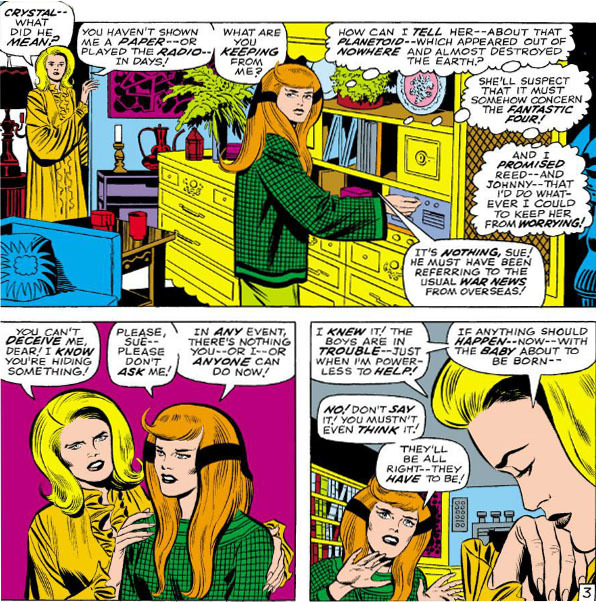 Given the degree to which Crystal of the Inhumans was involved with the Fantastic Four--first as Johnny's girlfriend and then as Sue Richards' replacement--it seems odd that the only two women of the early FF didn't really form that close of a relationship. 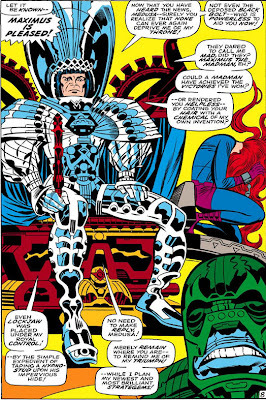 Johnny was Sue's brother, after all; and Sue could certainly have helped to acclimate Crystal to the FF's fighting style. Yet the interaction with Sue and Crystal was kept at arm's length, their cordiality with each other being presented almost as a given. 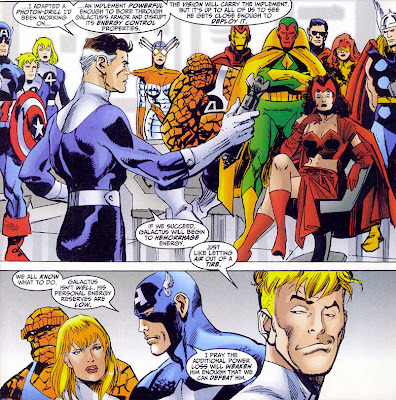 A lot of good characterization could have come of that relationship being built upon--and it could have made it easier for fans of the book to accept Crystal, once she took a more active role in the team. As you can see, Sue is still at the stage where she's a pleasant character, but not a particularly assertive one--and so she leaves well enough alone. But there's undoubtedly so much more ground for these two to cover, ground that I would have expected a writer of Englehart's talents to relish covering. Yet, as Crystal points out, the two women are of different generations, as well as very different women with clearly different pasts. Perhaps their lack of common ground is just too extensive for there to ever be more than a cordial respect between the two. While it's true that Jack Kirby produced a good deal of his full-page portraits featuring Marvel's principal characters, he also made some impressive pages where lesser characters rated their own dramatic presentations. Whether it was a villain preparing to strike, or a scene that drew you closer into a story, the placement of the page was timed well. 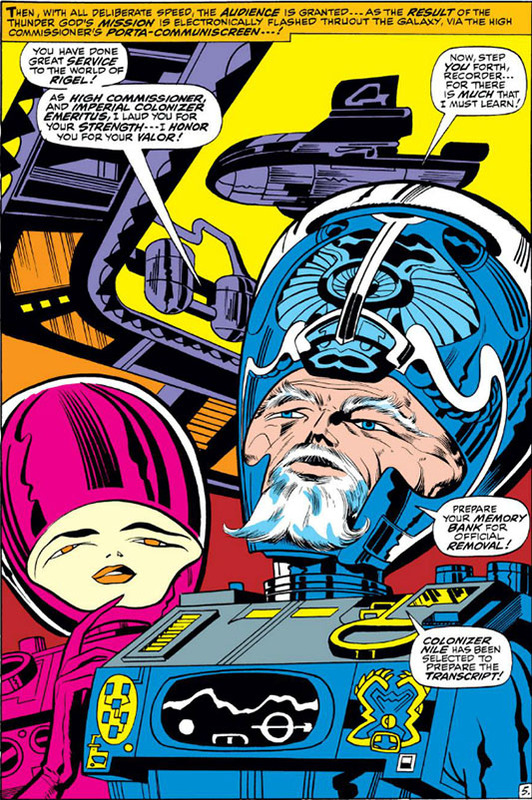 And though there were rare instances where the dialog on the page wasn't able to live up to the image, Kirby more than met the story halfway. 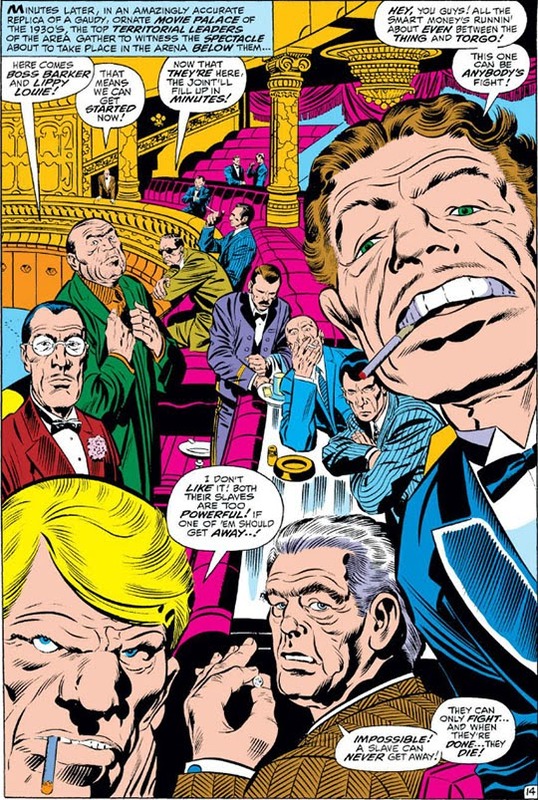 The only thing I might call into question would be the colorist's choice of making the chandelier the same color as the walls, ceilings, and pillars--but perhaps that was just an oversight. The Wizard made not one attempt to take out the FF, but two--using nothing but his new pair of "wonder gloves." I have to give the Wizard props for threatening his opponents with "wonder gloves." 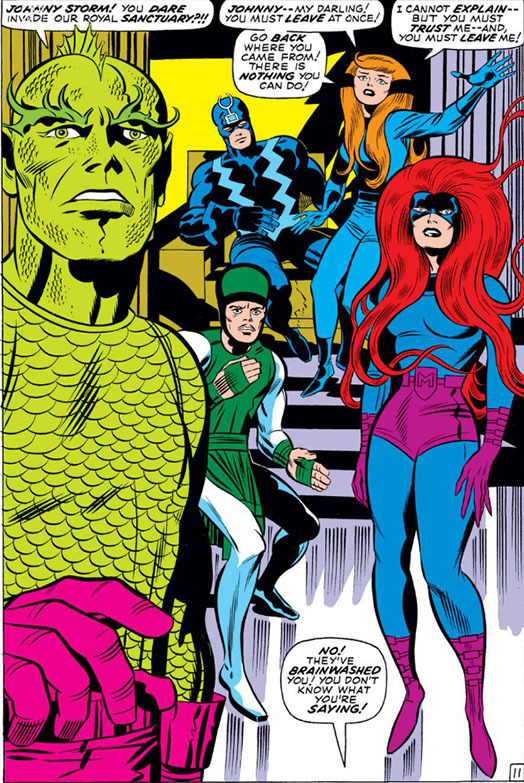 The FF probably annoy Wonder Man about it whenever they see him--"hey, Simon, why aren't you wearing your wonder gloves?? 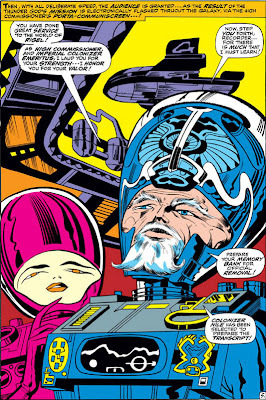 HAR HAR..."
Somebody should tell Galactus that if you call your ship a "visi-sphere," you're probably not going to be invisible to your enemy. Though I'd probably wait until the battle is over to point that out. I still don't know how Namor gets away with attending to royal matters of state in just a pair of swim trunks. 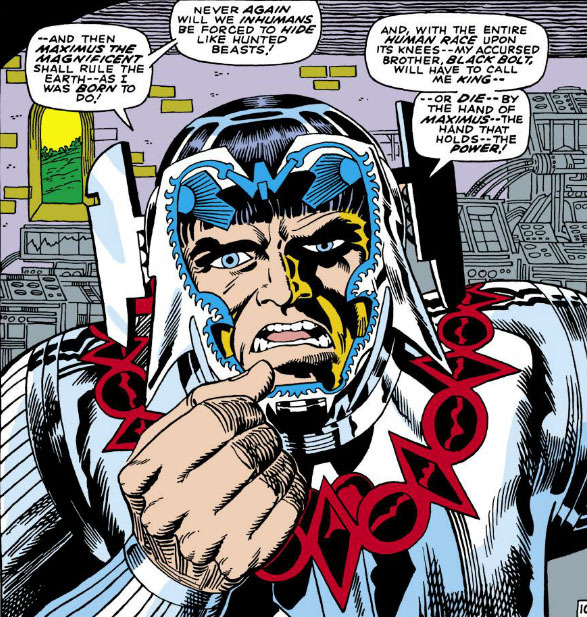 Then again, if you're the one stamping the royal seal on the dress code, you probably have sufficient carte blanche in the matter. Not all of Kirby's full-page portraits were so dazzling and impressive; in fact, there were arguably some scenes that got full-page treatment which didn't really merit the exposure of an entire page. But for this series, I think I've selected those which exceptionally stood out, hopefully piquing your interest to read the stories that were so skillfully crafted around them. 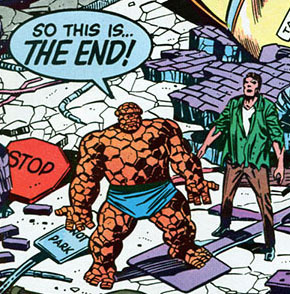 For as much as the wording refers to the scene of devastation surrounding the Thing and his human counterpart, it's also acknowledging a farewell of the magazine itself, as it ceases publication with this issue. Its sister book would continue publication for another fifty issues before it, too, folded; but as for the Thing, the character was simply shifting gears, continuing in The Thing the following month. 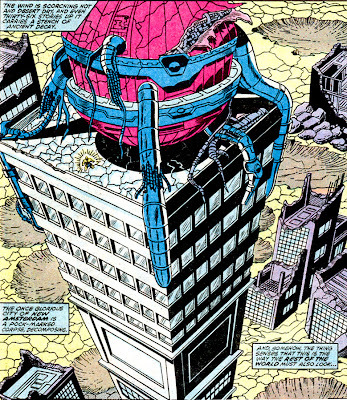 To those familiar with the story of Galactus, the picture is worth a thousand words: Galactus' elemental converter, once again grafted atop the Baxter Building, but this time abandoned apparently long ago. 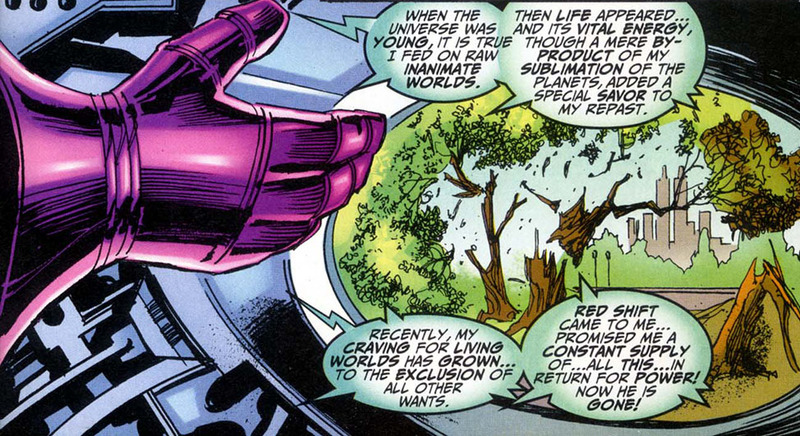 And the ruin and destruction surrounding the landscape make it clear that Galactus, too, has left, but this time after successfully stripping the planet of its life energy. The Thing has arrived on a dead planet. 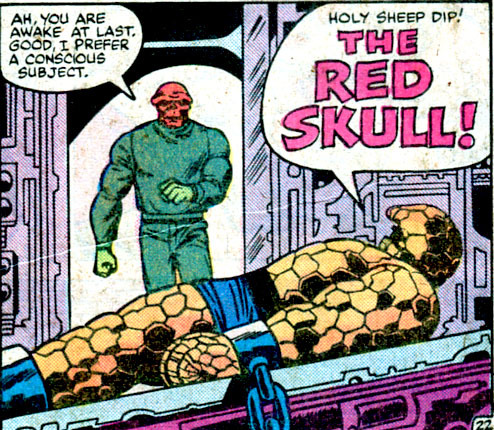 Once the Skull has been dealt with, the Thing prepares to head back to his own world. 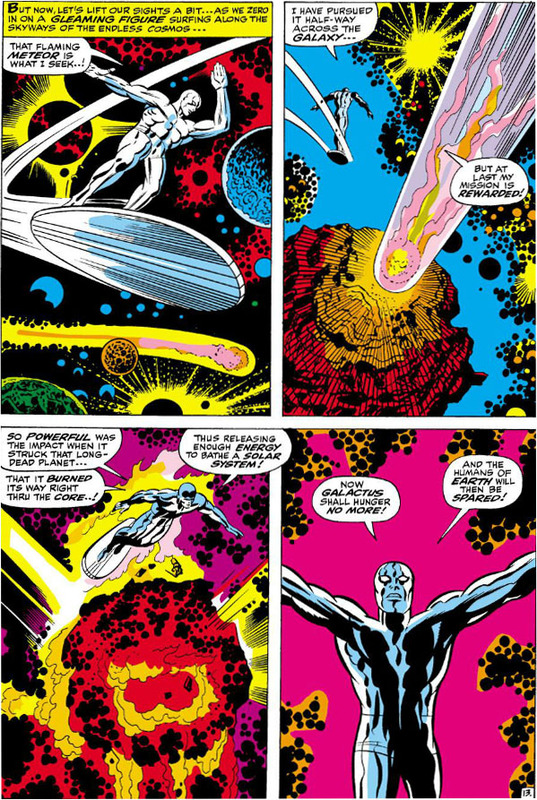 But aside from the obligatory beat-the-bad-guy diversion here, the story has Ben preoccupied with something that's worried him since his arrival on this world--that the action he took earlier to remove this Earth's Thing has somehow changed history in a way that led to the Earth being destroyed. 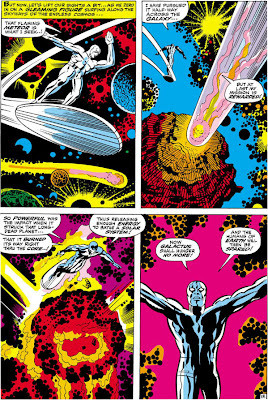 It's only when his human self assures him otherwise and points out the absence of the Silver Surfer's presence in the attack that the Thing feels some sense of relief; yet that does little to clear the melancholy he feels at leaving his other self to eke out an existence on a dead world. 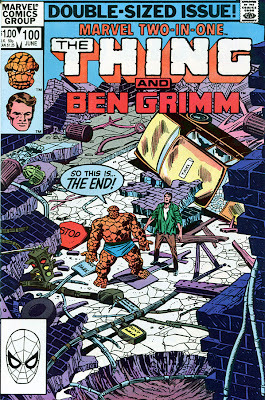 It almost seems fitting that the end of the Marvel Two-In-One series consists of a fine, self-contained story that offers something entertaining yet different than the standard team-up fare that has come before. Equally fitting is that such a story appears in the series' one-hundredth issue; so in reality, what we have here is a notable one-hundredth issue that would suit any other title coming up on its own centennial landmark, an issue which also happens to end the run of the book. 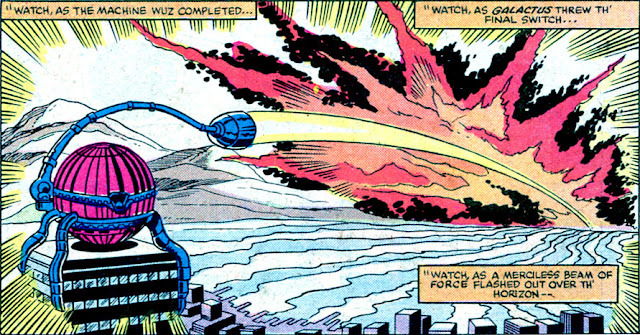 And "Aftermath," again, doesn't try to be more than that. 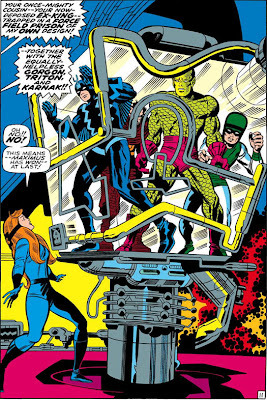 It closes the door of Marvel Two-In-One not with a thud, but with a satisfying click and gentle lock. 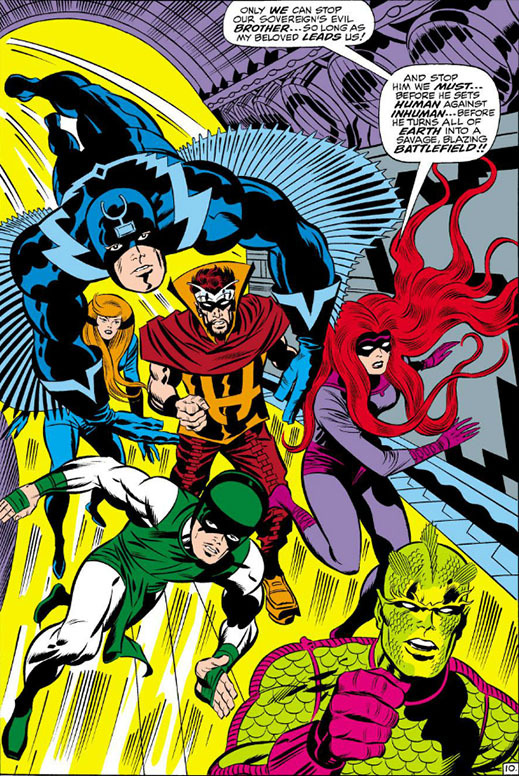 It doesn't carry the splashy fanfare that a usual "Issue #100" would attempt to convey, no--but in just seeking to convey interest and anticipation in the meaning behind two simple words, it succeeds in reaching both its pinnacle and the finish line. 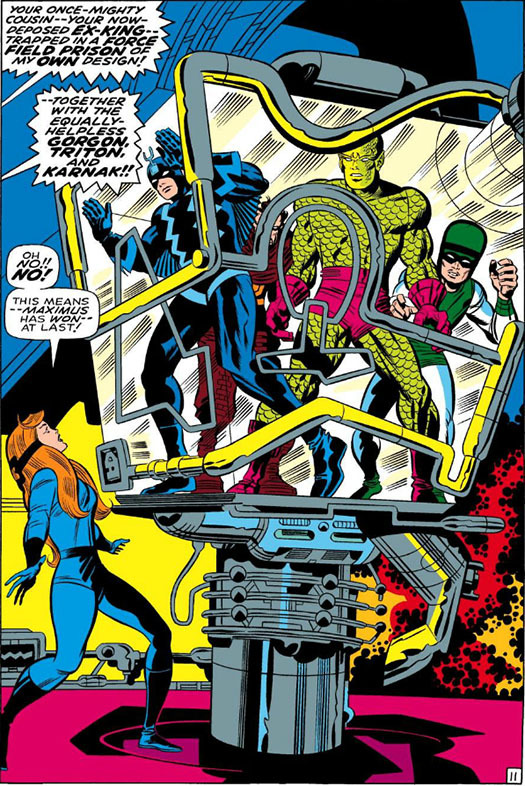 This issue is all about the consequences of the Surfer's bargain with Galactus--that the Surfer, once again acting as Galactus' herald, confine the worlds he targets for consuming by Galactus to only those which possess sentient life. 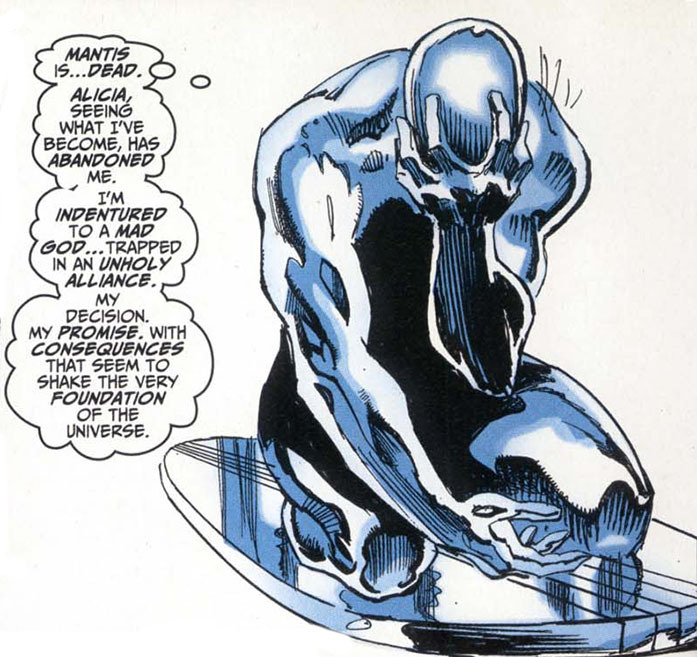 Yet the Surfer is also desperately trying to restore Galactus' health by breaking this "addiction" and returning him to a more "balanced" feeding consisting of a world's oceans, crust, and core--a shift that will also make him more receptive to the kinds of worlds the Surfer wishes to steer him toward. 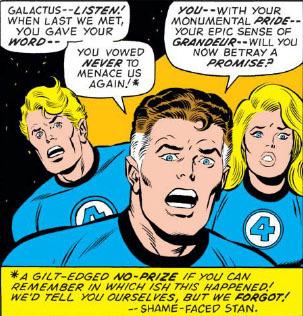 As I read this issue, I found the Surfer's frustration and despair coming across very believably. Of course gamblers, too, "buy now and pay later," and never look down the road as they're shoving more of their savings onto the table--and the Surfer's course of action in his ploy to save the Earth was nothing short of a gamble, hoping not to face the repercussions of his decision until if and when they materialized. 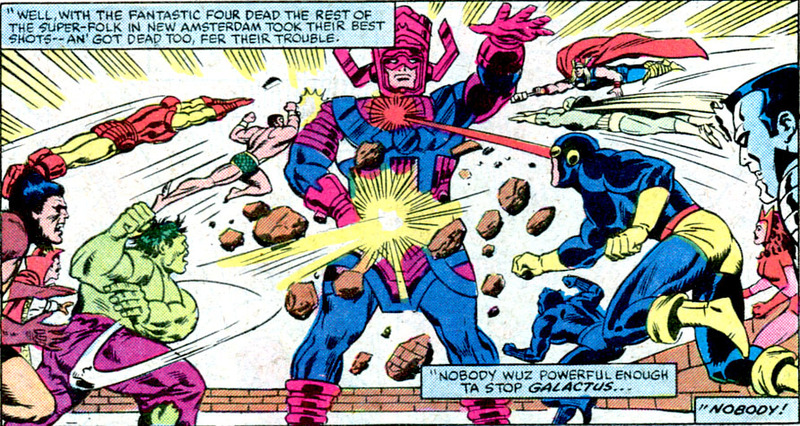 But they arrived sooner than later, with the Surfer almost immediately paying a severe price. 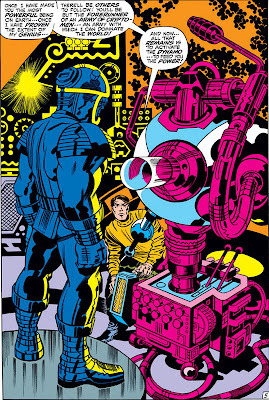 What I found uncomfortable about this issue--indeed, the tone of the entire series thus far--is its attempt to categorize the worth of the life of a species based on its level of sentience and intelligence. The world that Mantis and the Surfer had chosen for Galactus was full of all sorts of living beings--yet because their senses failed to register what qualifies for them as intelligence, it's perfectly okay with them for these living beings to be offered up for the slaughter. Translation: "Who's going to miss them?" 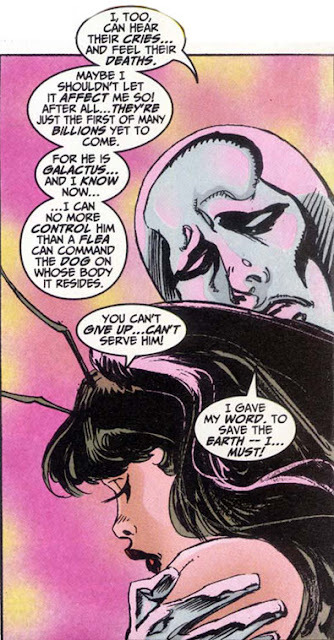 An offensive conclusion to which I can only respond: Who is the Surfer or Mantis to decide the worth of a life? Who granted them the power to define what level of sentience or intelligence is sufficient for a life's continued existence? 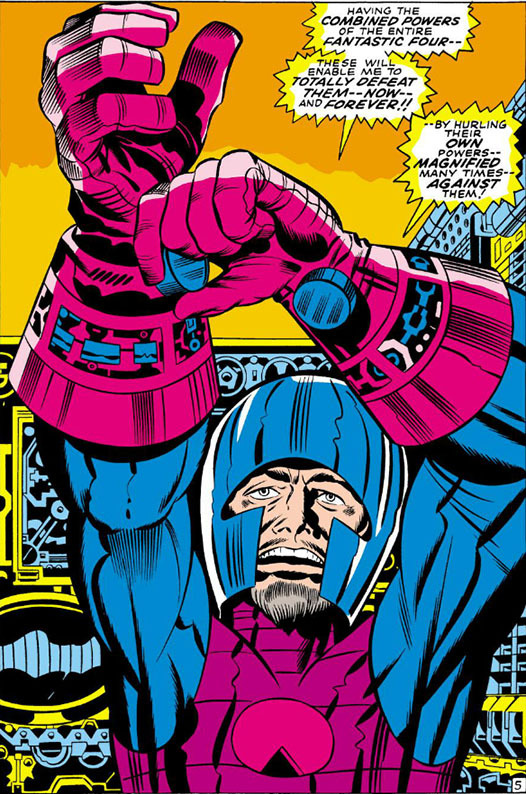 It's a flaw in the Surfer's thinking (and that of Galactus) that goes back as far as their first arrival on Earth--when Galactus likened the human race to ants, and the Surfer argued that they deserved to live because "These are not ants, Master! They think... they feel... they have created the primitive civilization which we see all about us!" Apparently birds creating nests--or the existence of ant hills, for that matter--can't measure up to the scrutinous, judgmental gaze of either the Surfer or Mantis. Once the Surfer is resigned to defeat, the issue ends with an implacable Galactus directing him to seek out the next world. 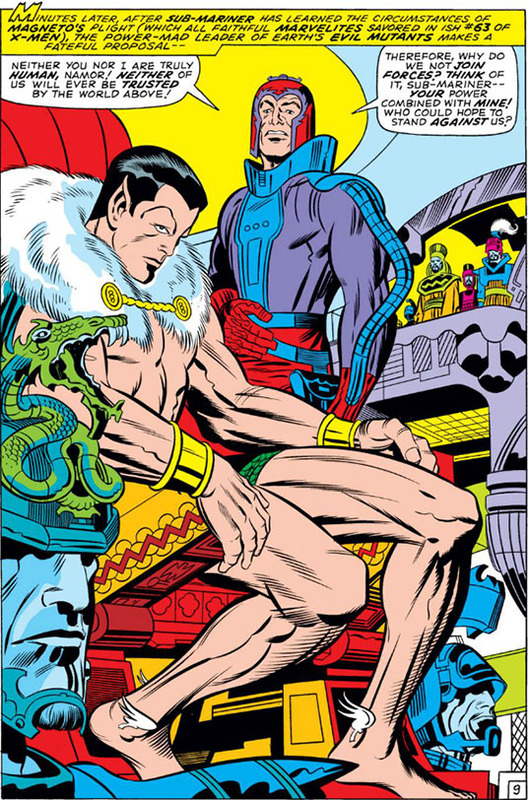 And you can bet the Shi'ar will have something to say about that, when we take our next look at this series. 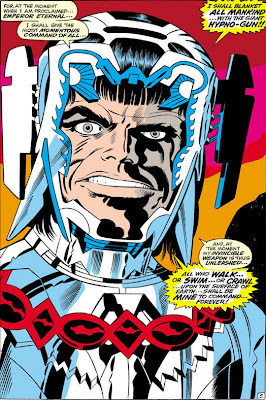 Like the Silver Surfer, full-page Jack Kirby portraits of the Inhumans were rare to come by, since they as yet had no series of their own and had to rely on guest appearances in Fantastic Four. 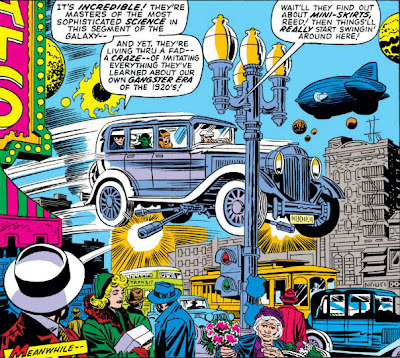 And with Kirby exiting the title at just over one-hundred issues, that didn't give the royal family many opportunities to appear in full-page shots. Kirby also made some nice pin-ups of the Inhumans which were featured in a Fantastic Four annual, which we'll take a look at sometime so that each member of the royal family can have their own page to shine. No one ever accused the Enchantress of having scruples--just power to spare and a tendency to indulge in betrayal. This particular betrayal took place after she formed a loose alliance with the Defenders in order to take vengeance against a witch-queen of another dimension who had laid claim to her partner-in-crime, the Executioner. 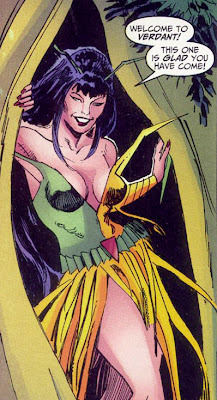 In fact, after succeeding in her quest, the Enchantress would have been only too happy to have been allowed to leave without further incident--if it weren't for the jealous Black Knight, who was still somewhat under the influence of a kiss from her which had effectively put him at her service, if you know what I mean. Whatever became of the Black Knight's statue? 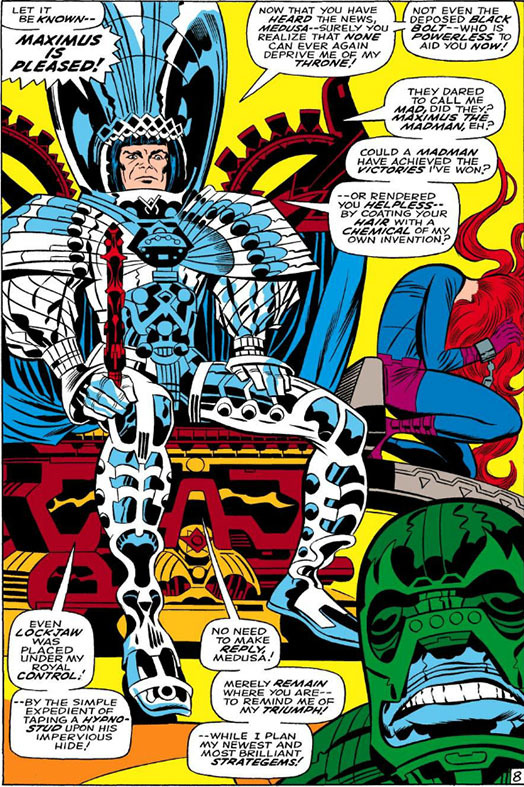 So here's what this installment finally clears up about Galactus' health issues, as well as his decision to return to Earth to consume it. We already knew that Galactus, in his destruction of various worlds for sustenance, made little to no distinction between worlds barren of life or those teeming with populations of whatever species inhabited them. The Silver Surfer, during his time as Galactus' herald, made a conscious effort to divert his master from populated worlds--that is, before Galactus tampered with his memories and, by extension, his conscience. 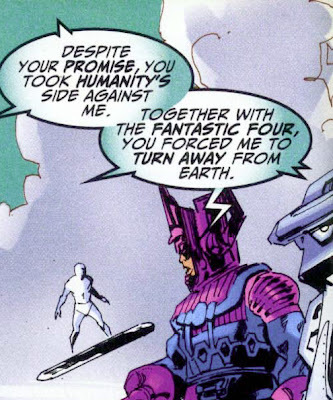 Yet, even with the Surfer's efforts now compromised, Galactus had no "preference" for the type of energy a world offered him, as long as it would sustain him. He maintained, you'll excuse the expression, a balanced diet. 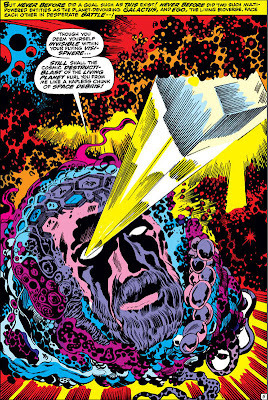 Suffice to say that, as if having Galactus roaming around the universe with a knife and fork wasn't bad enough, now he's become a virtual drug addict thanks to Red Shift, desperate to do whatever it takes to shoot up again, with no respite between feedings--and this time targeting only populated worlds. I think we can safely assume that a twelve-step program isn't going to work on this guy. 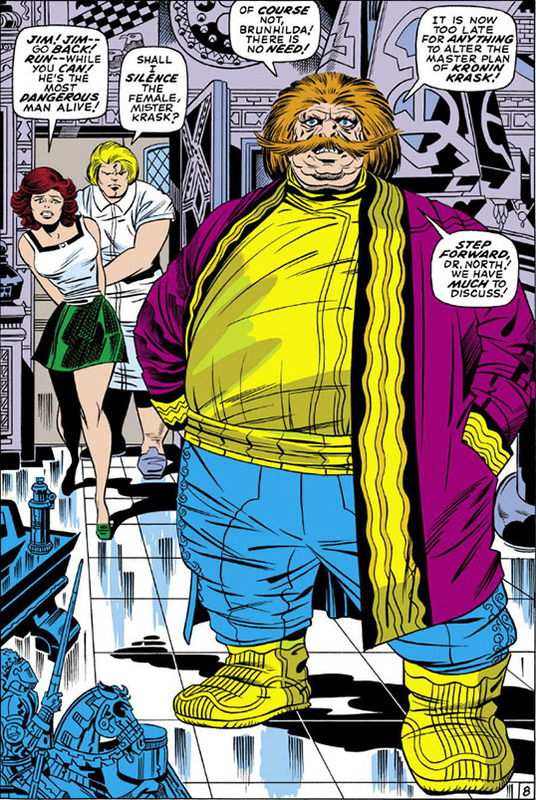 No idea how Reed knew about that, though. I doubt it's the sort of information Galactus would want to get around. Maybe the Watcher let it slip to Reed at some point. Man, the gossip Uatu must be able to dish. 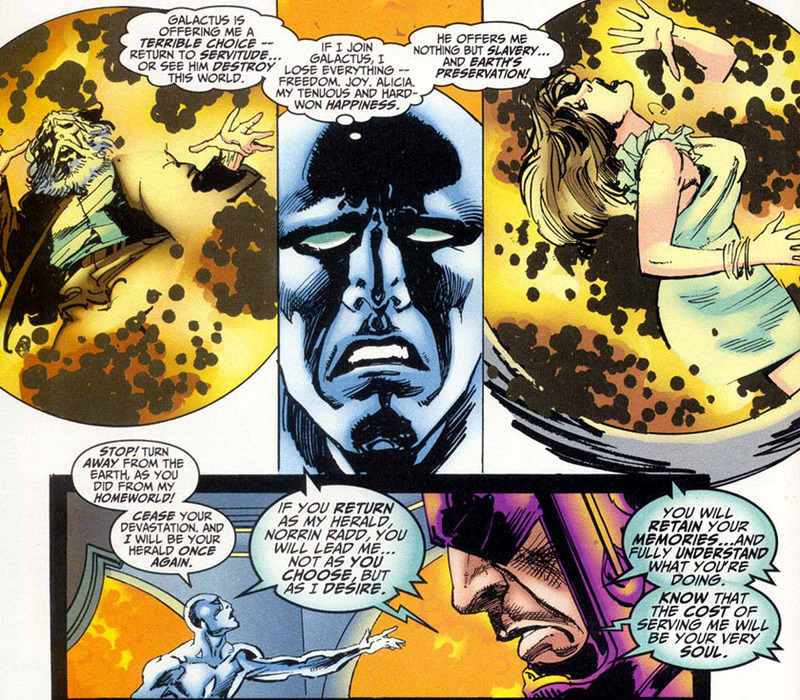 And the Surfer accepts. 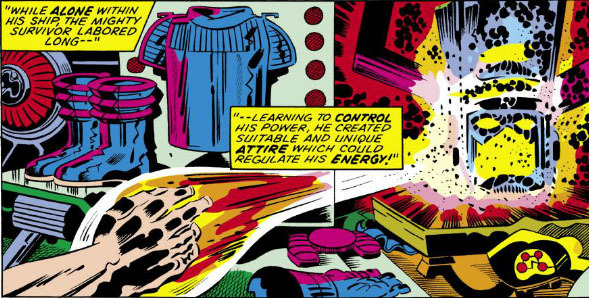 Only this time, there's no fine print involving sending Galactus to the Negative Zone. This guy isn't all that great with promises, is he? 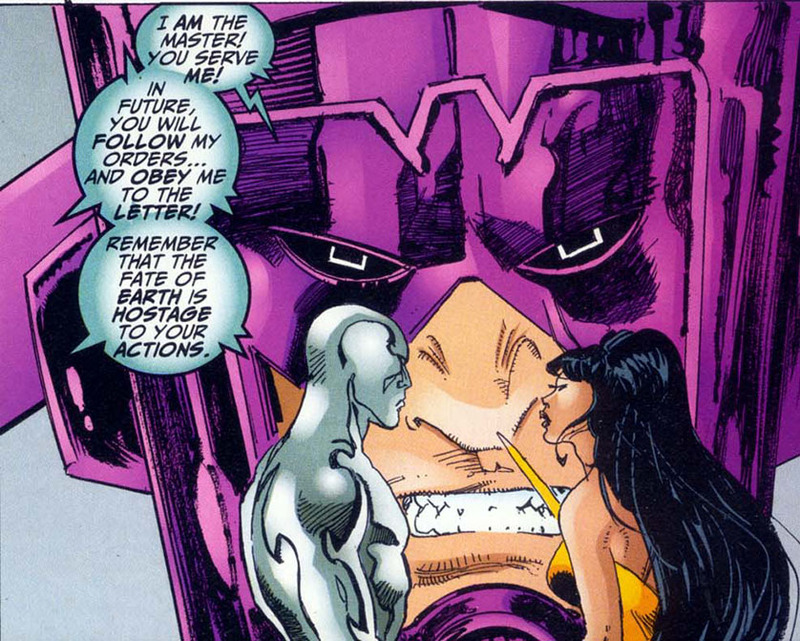 We'll see how he does in Part 4, when an old flame rejoins him. 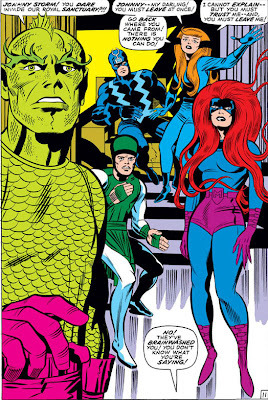 Let's hope Alicia doesn't show up, too. 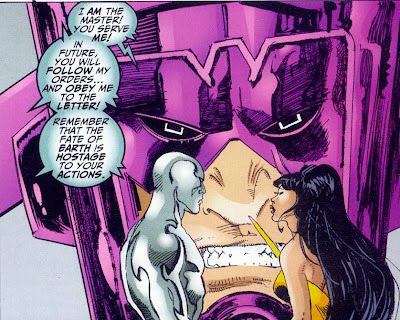 I'm not sure how Galactus feels about love triangles, but in his current state I'm guessing he's not crazy about them taking up the Surfer's time.